______________________ To post news in the Society Page, send e-mail to geotimes@agiweb.org with the subject: Society Page. Close to 300 scientists and engineers converged on Capitol Hill April 4-5 to visit their Senators and Representatives. The annual Science-Engineering-Technology Congressional Visits Day drew a record number of attendees, including geoscientists from 10 American Geological Institute member societies. The scientists sent a resounding message to Congress to balance federal investment in the physical sciences with the federal government’s strong investment in biomedical research. They also lobbied for improved science and technology partnerships between government, universities and industry. Participants also delivered messages on behalf of their societies. Marguerite Toscano, president of the Association for Women Geoscientists, supported advancing women in the geosciences. “Thirty to 40 percent of women Ph.D.s don’t find employment in the professional workplace,” Toscano said. “Instead they find a chilly climate.” Other societies represented at the conference included: the Association of American State Geologists, Clay Minerals Society, Society for Mining, Metallurgy and Exploration, American Institute of Professional Geologists, American Geophysical Union, Geological Society of America, Association of Earth Science Editors, American Association of Petroleum Geologists and Society for Sedimentary Geology (SEPM). On Feb. 17, the National Academy of Engineering elected new members, including Franklin M. Orr, a past trustee of the AGI Foundation. Orr is dean of the School of Earth Sciences at Stanford University and was honored for his contributions to understanding complex multicomponent flows in porous media and its applications to the design of enhanced oil recovery processes. Oceanographer Norden E. Huang of NASA’s Goddard Space Flight Center hydrospace processes laboratory in Greenbelt, Md., was honored for his contributions to the analysis of nonlinear stochastic signals and related mathematical applications in engineering, biology and other sciences. Henry H. Rachford Jr., principal technical adviser of Stoner Associates Inc. in Houston, was honored for his contributions in the numerical solution of partial differential equations to solve petroleum reservoir and pipeline hydraulics problems. Robert M. Sneider of Robert M. Sneider Exploration Inc. in Houston, was honored for teaching and demonstrating the importance of synergistic geological, geophysical and engineering efforts in the exploration and development of hydrocarbon accumulations. Garret P. Westerhoff, chairman and chief executive officer of Malcolm Pirnie Inc. inWhite Plains, N.Y., was honored for leadership in applying new technologies for drinking water treatment and for contributing to international utility management. Luis Esteva of the Institute of Engineering at the National University of Mexico in Mexico City was honored as a new foreign associate at NAE for his contributions to seismic design and reliability analysis of structures and for leadership in international earthquake engineering activities. 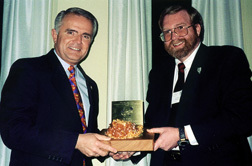 The Association of American State Geologists presented the 2000 Pick and Gavel Awards to Rep. Jim Gibbons (R -Nev.) and Rita R. Colwell, director of the National Science Foundation. The awards recognize individuals who have made significant contributions to advancing the role of geoscience in public policy and have supported AASG’s mission in government affairs. Geology, on March 14. AASG. Gibbons was honored for his understanding and support of the applications of geology to society. He was a co-sponsor of legislation to reauthorize the National Cooperative Geologic Mapping Program and establish a charter for AASG. Gibbons fought as a combat pilot in Vietnam and the Gulf War. He has worked as a lawyer, a state assemblyman, a commercial airline pilot and most recently as a congressman. But first he was a geologist. He worked as a hydrologist for the Federal Water Master, which regulates the Truckee River and Carson River that flow from the Sierra Nevada in California into the Nevada desert. Gibbons was also a mining and exploration geologist. His experience in industry led to a desire to pursue the legal and environmental aspects of science policy. Colwell was honored for her support of earth science and education. She has authored or co-authored 16 books and more than 500 scientific publications. She was president of the Biotechnology Institute and professor of microbiology at the University of Maryland before taking charge of NSF in August 1998. Even at 100 years old, Walter D. Keller of the University of Missouri (MU) in Columbia, Mo., still drives his 1970s baby-blue Volkswagen beetle and commonly asks graduate students and faculty intriguing questions on current scientific literature. “If there hadn’t been mandatory retirement, he still wouldn’t be retired,” says Glen Himmelberg, chair of the geology department at MU. 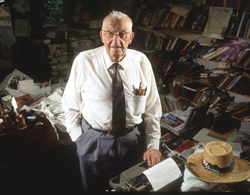 Keller was born March 13, 1900, in North Kansas City, Mo., and can still remember life without electric refrigerators, telephones or televisions and the introduction of the Model-T, the Great Depression, both world wars, the Apollo moon landing and the Y2K bug scare. He has several favorite field sites including the Wind River Range in Wyoming and the Refractory Clay area in Missouri. Former graduate students recall Keller driving into the department’s field camp in the late 1950s with his old Chevy hanging suspiciously low to the ground. It was so full of rocks, Keller had to jack up the bumpers each night to relieve the springs. Keller began teaching geology at MU in 1926 after first attending as an undergraduate. He also holds a bachelor’s degree in ceramic engineering from the Missouri School of Mines and a master’s degree in geology from Harvard University. He is a distinguished member of the Clay Minerals Society and winner of many prestigious awards in geology and teaching, including the Outstanding Educator of America Award. Walter D. Keller is a living legend. The University of Missouri celebrated Keller’s birthday in gala style on April 8, presenting the Geology Department the new $100,000 Walter Keller Opportunities for Excellence Endowment. Eduard Henri “Henk” Dahlberg — a well-loved local celebrity for his discovery of the mineral Hibbingite in his adopted hometown of Hibbing, Minn. — died of cancer Feb. 7. He was 59. Originally from Suriname, South America, Dahlberg earned his doctorate in petrology from the Rijks Universiteit Utrecht the Netherlands in 1969. He returned to Suriname to work as a geologist for the Geological Survey and later became its director. He also worked for the Department of the Interior in Suriname. In 1983, Dahlberg received a Hubert Humphrey Fellowship from the University of Minnesota and moved to the United States with his wife and son. In 1991, while working on logging and analysis projects for the Minnesota Department of Natural Resources, Dahlberg, manager of the Mineral Potential Unit, discovered a new mineral barely visible to the naked eye. In 1993, the International Mineralogical Association recognized the iron-hydroxy chloride mineral as Hibbingite. Dahlberg often led field trips to the Mesabi Iron Range and participated in many organizations that focus on mineral resources. As vice president of Small Scale Mining International, he consulted on mining and environmental issues for developing countries, lectured for the United Nations and helped to strengthen World Bank initiatives concerning small-scale mining. Associate Editor Christina Reed compiles the Society Page.